This study explores an approach that simultaneously estimates Antarctic mass balance and glacial isostatic adjustment (GIA) through the combination of satellite gravity and altimetry data sets. The results improve upon previous efforts by incorporating a firn densification model to account for firn compaction and surface processes as well as reprocessed data sets over a slightly longer period of time. A range of different Gravity Recovery and Climate Experiment (GRACE) gravity models were evaluated and a new Ice, Cloud, and Land Elevation Satellite (ICESat) surface height trend map computed using an overlapping footprint approach. When the GIA models created from the combination approach were compared to in situ GPS ground station displacements, the vertical rates estimated showed consistently better agreement than recent conventional GIA models. The new empirically derived GIA rates suggest the presence of strong uplift in the Amundsen Sea sector in West Antarctica (WA) and the Philippi/Denman sectors, as well as subsidence in large parts of East Antarctica (EA). The total GIA-related mass change estimates for the entire Antarctic ice sheet ranged from 53 to 103 Gt yr−1, depending on the GRACE solution used, with an estimated uncertainty of ±40 Gt yr−1. 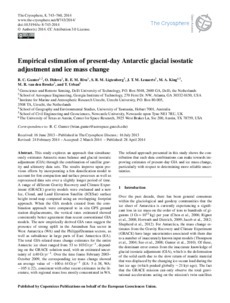 Over the time frame February 2003–October 2009, the corresponding ice mass change showed an average value of −100 ± 44 Gt yr−1 (EA: 5 ± 38, WA: −105 ± 22), consistent with other recent estimates in the literature, with regional mass loss mostly concentrated in WA. The refined approach presented in this study shows the contribution that such data combinations can make towards improving estimates of present-day GIA and ice mass change, particularly with respect to determining more reliable uncertainties.